The helmet arrived today and to say it was worth the wait, is the understatement of the millennium! The standard of finish and your attention to detail is breathtaking. Its such a beautiful object, it stands up as a piece of sculpture in its own right. My husband was absolutely overjoyed! Remember these aren't stock items - I have to make these for you and make them look as good as, or better, than the prototype photo set. They are dictated by the insured + tracked service. AT THIS PRICE POINT, THESE ARE CREATED FOR PRIVATE COLLECTORS + TROOPERS, not for industry insiders. It is a full size prop replica of the EMPEROR'S ROYAL GUARD , seen in STAR WARS: RETURN OF THE JEDI. There are several recast Master Replica versions out there - this is not one of them. I received very flattering comments from the 501st in Utah, but have never officially submitted them. See FORCE AWAKENS end credits screen capture. Sadly, I was fully booked and could not meet the August 2015 time deadline, I think it was for Rogue One. I'd love to be involved officially in a SW film. Brand new, custom made props - created from a professional 2011 sculpture. Hand crafted and finished to a superb level. Each one takes several weeks to build, hand laminated resin, not ABS. Cast as a single piece, from a one-part flexible silicone mold, there are no join seams or bubbles. All edges are meticulously hand-finished - reinforced, then bevelled and rounded as you would expect from a top tier item. This helmet is a durable, hard-wearing polyester/ fibreglass construction. Lloyds approved Marine Grade gelcoat. DEPTH (FRONT TO BACK) - 14 inches or 36 cms. INTERIOR (HEAD SIZE) - Maximum: 9 inch diameter circle (24 cm circle) or 27 inch circumference (68 cm) all round. To give you a proper idea of scale, I'm wearing the ERG helmet in the last photo. I'm 6'1 tall. The interior is smooth and snag-free. Coloured felt strips are applied to the interior shoulder undersides, for "soft" contact with the base. The base is included with this item and is completely detachable. It is contoured to follow the curves of the helmet. The helmet sits on top and can be manually centred, left and right. It drops into front & back position naturally, with little intervention. The base is a polyester/ fibreglass construction and is finished with black granite effect paintwork. All edges are neatly fitted with black rubber trim. The black granite finish is vinyl and is suitable for indoor display only. I hope you like this classic red EMPEROR'S ROYAL GUARD (ERG) and display base. These helmets/ lids are built new with every listing. If you have any questions - I will be happy to answer them. This helmet and display base will be posted PARCELFORCE48 - SIGNED FOR (Domestic). And PARCELFORCE GLOBAL PRIORITY (International) in a strong cardboard box (18" x 18" x 24) and plenty of bubble wrap. All other destinations will read the highest flat rate, by E b a y default. As a 3D artist (ceramics + plastics) it's more about enjoying the making process. I do take my time and generally go into overtime to ensure a good final result. Making these from scratch is an art, not an exact science, and given enough time - they're studio worthy pieces. 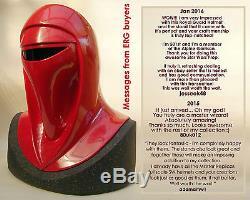 The item "Star Wars Emperor's Royal Shadow Guard Full Scale Life Size Helmet Prop + base" is in sale since Sunday, June 05, 2016. 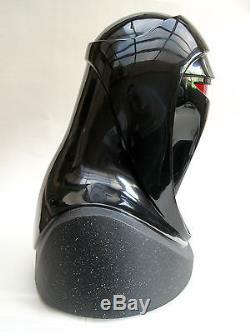 This item is in the category "Collectables\Science Fiction\Star Wars\Other Star Wars". The seller is "futurama1971" and is located in Rochester, Kent. This item can be shipped worldwide.